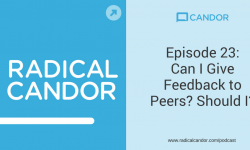 In previous episodes of the Radical Candor podcast, Kim and Russ have talked a lot about feedback. 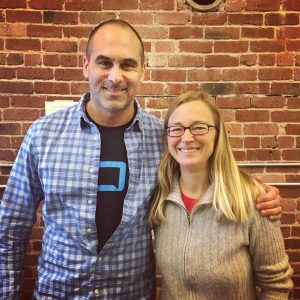 This week, they dive into another way to build relationships with people on your team: Career Conversations. Russ developed this process when he was at Google when he noticed that a lot of people felt frustrated that they weren’t getting where they wanted to be in their careers. They felt stuck, like they weren’t making any progress. Russ came to realize that these people needed a sense of their endgame and an intentional process for putting together a short term plan, so he came up with this Career Conversations approach. It’s hard to say your dreams out loud, especially to your boss. But as a boss, part of your responsibility is to encourage people to dream, and to help them take a step in the direction of their dreams. You need to give people license to dream. 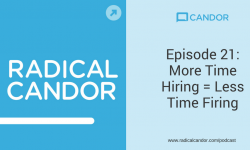 Russ and Kim finish off the episode with tips for getting started with Career Conversations. Learn more about these tips by listening to the episode! This week’s Candor t-shirt winner is barbskinner1! Barb, you’ll be getting one of these shirts that Russ wears pretty much every day, as you can see in this photo of Russ and Kim. Listeners, you could be our next winner! Just leave us a review on iTunes to enter. We’re randomly selecting listeners from iTunes reviews and announcing them on the show each week. 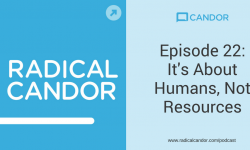 Tune in each week to hear if you’ve won a Candor t-shirt. Another engaging and actionable podcast! Thanks, Kim and Russ! Really enjoy the vibe, the knowledge, and the empowerment! I think if my boss asked me tell them my life story from kindergarten on, I’d feel obligated to do so but I’d be super uncomfortable. I’d probably make something up that sounded ordinary and reasonable, bc my past is neither of those and asking about it when there’s an unbalanced power dynamic is weird and invasive. First, thank you for this input. This is a reasonable point, though the main reason that I added this particular conversation to the process was because through experimentation, I’d learned two crucial things: Most people – and by most, I mean 99% – have a great experience with this. One person I worked with at Twitter, not knowing I’d developed the process, came out of the conversation with his manager so psyched and said, “WOW! I have never had a career conversation more focused on ME!” There are a lot of benefits to this conversation for manager and direct alike, and in my experience both tend to think it’s positive. That, however, doesn’t matter for someone like you who would find such a conversation invasive. I teach a workshop on this, which is much longer and more detailed than a :25 podcast, and one of the points that I make is about honoring boundaries. I will more or less put the managers on high alert that some – few – but some will be uncomfortable with one aspect of this or another and that it’s crucial to listen someone dropping a boundary and then honor it aggressively. I was having this conversation with someone in my organization years ago, and he revealed to me that he was transgender. For me, not a big deal, but for him, as he noted, this was the first time he’d ever disclosed this fact to someone at work. He was comfortable, relaxed, and it just sort of came out. This became a focus for him in the conversation. I assured him, of course, that the conversation was confidential (notice I’m not naming a person, a company, or even a time frame, and I might even have intentionally mixed up the gender here) and that we needn’t dwell on that at all, which we didn’t. Luckily, he and I had a good relationship and we got back into a groove, and simply I took his lead on whether his gender transition was further discussed or not (turns out he wanted to talk a little bit more, so it was ok). I use this, though, as a real life story to make your exact point – there are aspects of people’s lives that they do not want to share with their bosses and you, as a boss, need to make it clear that they are fully empowered to drop the boundary curtain – simply by not mentioning things they don’t want to mention – and if a boundary is dropped, I tell managers that they must honor the boundary to the fullest. Approaching thousands of iterations, have not had a person fully punt on having this conversation, but if they say “don’t want to do this,” that needs to be ok, too. Thanks for your reply. Since you couldn’t squeeze the importance of recognizing and respecting boundaries in this 25 mins, that might be could a good topic for another podcast episode. I know any number of people who don’t feel like their boss knows the difference between a boundary and an invitation. I love the idea of having a career conversation but I’m the employee. Typically some of the basics are covered during the interview process, but I actually got my current job based off previous work experience and didn’t do a formal interview with my current boss. So I feel like having a career conversation would be very beneficial, but how do I approach the subject as the employee not the manager? I’ve been loving the podcast and am super excited to read the book! Thanks so much! Seems that this type of conversation is tailored to a “white-collar” employee cohort. As a boss in a production environment, I too would like to be able to meaningfully speak to my team’s dreams. Plus with a larger number of direct reports, the time commitment involved in even the “life story” section is a bit daunting. How is this approach adaptable to a less professional setting? Thanks for the note. This is a really good push that got me thinking. You’re probably right that this overall process biases towards white collar. I say in a lot in my workshops that “to have bias is to be human” and given my professional life has been pretty much all white collar, it seems likely a process that I’ve developed would bias toward that cohort. At a minimum, the way I communicate the process would almost certainly bias toward white collar. I deeply appreciate this insight from you! Generally a fan of the bias-shattering question. Important note: This “white collar bias” was absolutely unintentional. I thought quite a bit about your comment, and my main thought is that there’s no reason that it needs to be the case that this is “only for the white collar employee cohort,” but there might be a couple adaptations that will help. I think the primary adaption is one of mindset – you’re right, every employee deserves to have their manager engaged in their dreams. Start there. Read: it’s not absolutely necessary to start at Life Story. In terms of execution, a key point here is that *the most important part of the process and often with hindsight what is seen as most valuable* is the visioning effort and conversation. This is super important because the order of the process – Life Story – Dreams – Career Action Plan – means that many people with good intentions do the Life Story part of the process and then stop. Unconsciously life takes over or consciously, they perceive this to be the most important part of the process. Also, the visioning portion is significantly harder – a much more pre-frontal cortex intensive process and the part that often meets more resistance from employees because of the excuse of “I don’t know what I want to be when I grow up.” Anyway, bunch of reasons why people halt after Life Story, which is actually a fatal flaw in execution. I say that because I believe that the Life Story conversation is definitely the least important part of the process. Don’t misunderstand. It’s still important, or else I wouldn’t have included it, but in a world in which real people are trying to execute around real priorities, I would order the importance 1) Visioning, 2) CAP 3) Life Story. Worth noting that the Life Story part of the process, though ordered first, was actually the last part I added to the process. The reason I added it was because I started to have a lot of internal questions about where the hell people were getting their visions from and realized that no matter how much of a “chill bro manager” I was, there was still a power differential, and the results I was getting were often inauthentic, maybe someone trying to impress me, trying to impress their family or friends, or trying to impress themselves. I realized I needed a way to better understand what folks really, deeply care about, and developed the Life Story (aka “Getting to Values”) conversation to enable that. Recall the the primary objective is to understand a handful of values/drivers/motivators that are illuminated by certain pivots in a person’s life, and secondarily is to get to know them. Both matter, of course, but always remember in this conversation that curiosity is good, but curiosity with a purpose is better. All of that to say… You can run a pretty good process by lopping off the Life Story conversation entirely and making it just about Visions and CAP. This idea makes me sad, because although it’s least important, it’s still my favorite, but when confronted with a need to honor priorities and make real trade-offs, that’s a pretty good way to go. Still, I would advocate for taking a longer view here. I would think about running full process for full team, but have your effort transpire over a much longer period of time. Could you run a high quality life story with each member of your team over the next year? I mean, if you have 52 direct reports, that’s one per week for 52 weeks. Seems doable. So my preferred approach in an environment with a large number of directs is to execute over a longer period of time. Prioritize the people who are “really into it” and just plug away, grind it out. With respect to adapting to more of a blue collar environment, the more I think about this, the more important I think it is to get in touch with the long-term career aspirations of the folks on the team and I would argue there is no meaningful adaptation to be made, but rather, it’s even more critical not to accept incremental job progression from your people and push them hard to really find the DREAM. I can imagine you as the manager playing an enormous role in enabling folks to think bigger, to imagine possibilities they couldn’t have possibly imagined or were implicitly taught not to imagine. My basic rationale: Turns out social mobility is unusual in the US. About 80% of the time, if your parents were blue collar, you are blue collar and if your parents are white collar, you are white collar. I doubt the former is entirely by choice. With the visioning complete, building a robust Career Action Plan around the 4 pillars: Training, Networking, Make changes within current role, and Determine next job – seems very, very high leverage and ripe for high quality, tactical actions in a blue collar environment, irrespective of whether the employee imagines a white collar dream or a blue collar one. My main – and somewhat selfish – encouragement is this: Will you please try some stuff and then hit me up? My email is firstname@lastname.com. Would love to hear how it goes and what, if anything, should be adapted to better suit a blue collar environment. Again, start with folks who are more into this kind of stuff. The main reason is that you’ll have more success quickly and also you’ll get better at the process with people who are open and who can actually help you shape it. PS… Kim’s suggestion below is pretty good, too. :). Thank you for your question! I realize that we are talking about this incorrectly if it seems only to apply to white collar. You are right, everyone has dreams, and it makes your work as a boss more meaningful, and helps you achieve better results as a boss, if you can take the time to get to know the dreams of each direct report. If you have too many direct reports for that to be possible, here is what I would suggest. Choose five employees to be your direct reports. Have conversations with those five. Then ask each of them to do it in turn for five others. And so on until everyone has had this opportunity. Do you think that would work? I’ve suggested this approach to “white collar” bosses who also often have too many direct reports to be able to spend so much time with each one. It’s not ideal but it’s better than nothing.